In today's market where sales of green building products are growing by 30 percent a year, every company is trying to claim that their product is "green." The makers of Vetrazzo recycled glass countertops are redefining what it means to be green by producing the most eco-friendly surface materials on the market, and honoring the triple bottom line of "people, planet, and profit" in their everyday business operations. Vetrazzo believes that a green product should do more than just use recycled materials or avoid release of dangerous airborne toxins -- it should solve an environmental problem. Vetrazzo does just that by creating a new market for waste glass, including glass that cannot be recycled into other products. Each countertop panel is made from 550 pounds of crushed recycled glass from traffic lights, windshields, and beverage bottles. In 2007, Vetrazzo transformed over 250 tons of recycled glass -- including 125 tons of waste glass not recyclable elsewhere -- into beautiful, functional surface products. "Sustainability is achieved when you no longer have to sacrifice aesthetics for the good of the people or the planet," says James Sheppard, president of Vetrazzo. "People won't do the right thing if the right thing isn't gorgeous." The company's revolutionary commitment to the triple bottom line -- serving people, planet, and profit -- is the larger story. PEOPLE: At a time when manufacturing jobs are outsourced all over the world, Vetrazzo is keeping living wage jobs at home. They offer full health and dental benefits while paying 50 percent higher wages than many other West Coast manufacturing jobs. With its state-of-the-art manufacturing facility in a remodeled Ford auto plant, Vetrazzo focuses on local hiring in economically depressed Richmond, California. Workers enjoy natural light, safety equipment that goes well beyond what is mandatory, and a continuing education program. Vetrazzo believes this investment in their people produces highly motivated workers, greater retention, and a top-quality product. PLANET: Vetrazzo's most obvious commitment to the planet is the use of recycled glass that would otherwise go directly into landfills. Vetrazzo offers a "green alternative to natural stone" like granite and marble, which come with a steep environmental price tag. "Quarried stone products are usually produced in developing countries that often don't have adequate worker safety regulations and are quarried in a way that is very destructive to the environment," says Sheppard. And burning the fossil fuel necessary to transport those heavy materials halfway around the globe releases greenhouse gasses that contribute to global warming. Even the company's daily operations are designed with the planet in mind. Vetrazzo operates on a closed-loop water filtration system, saving approximately 150,000 gallons per month. The factory will be 100-percent solar powered by year's end. PROFIT: The socially responsible entrepreneurs of Vetrazzo wanted to do more than make a green countertop, they wanted it to be beautiful, durable, and distinctive. And they wanted the entire company to be sustainable with a focus well beyond economic profit. The community's economic health and the planet's environmental health are equally as important as the bottom line at Vetrazzo. Vetrazzo, LLC transforms recycled glass into artful home or commercial surfaces including countertops, tabletops, and walls. Invented and first produced in 1996 by Counter Production, Vetrazzo surfaces enable customers to showcase their individual sense of style and respect for the environment. 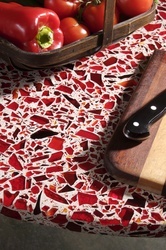 Vetrazzo uses only recycled glass, in a patent-pending formulation comprised of 85-percent recycled glass by weight. Vetrazzo is made in the United States, with headquarters in Richmond, Calif., and dealers and fabricators across the country. For more information, visit http://www.vetrazzo.com.